We find ourselves in the 3rd “summer slowdown scare”, just like 2010 and in August 2011. During this time the perma-bears crank up the alarm bells and we are bombarded with a cacophony of ill tidings that spell the doom of the U.S economy. As we saw in 2010 and 2011 the economic slowdowns turned out to be “soft landings”. Investors scared into the side-lines stared in disbelief as the U.S stock markets roared ahead leaving them behind. We may well be in the same position now. The permabears are coming out the woodwork. Bad, scary articles and news seem to attract more attention and eyeballs than good news articles or those that offer a counterbalanced view. Whenever someone gets interviewed on US TV, it’s for someone proclaiming the end of the expansion – you never see them interviewing someone offering a counter view of a more positive nature. As an outsider (I do not live in the US, I live in Cape Town) I am often amazed by how Americans are quick to write-off their own economy. I still believe it to be one of the most resilient, competitive, innovative, durable and adaptable economies on the planet. It usually requires a sucker-punch to take it down. I was so exasperated with the despair been painted in the US in October 2011 that I did something I’ve never done before. I penned an article which the folks at Advisor perspectives kindly published on 3rd January 2012 titled “U.S Recession – an opposing view” It seemed like reputational suicide at the time – just about every reputable advisory and blogger had written off the U.S economy. Fortunately as an outsider, I had nothing to lose and neither did those investors that stuck it out – the SP-500 has gained 7.6% since then (as at 3 July 2012) peaking on 2nd April 2012 with an 11.1% gain. To his credit, John Hussman acknowledged the research and approach even though he did not agree with the conclusions. He didn’t have to – he is a big fish and I am the minnow. He spent quite a few paragraphs dismissing my methods but I did not mind. In this business, everyone’s story has holes you can easily pick out. I do read Hussman regularly, he is thorough and I appreciate his quantitative work and he keeps me honest. Whenever I am convinced there is no recession, I temper my enthusiasm by re-reading his bearish articles making sure I always maintain a balanced view. One day he will be right and I will be wrong but at least I won’t be blindsided. Right now, the models I presented in the January 2012 article are still far from recession territory. But they are also far from full blown expansion. The US economic growth remains tepid and sub-par, vulnerable to the slightest external shock. Risks are not negligible, but neither are they full-blown. 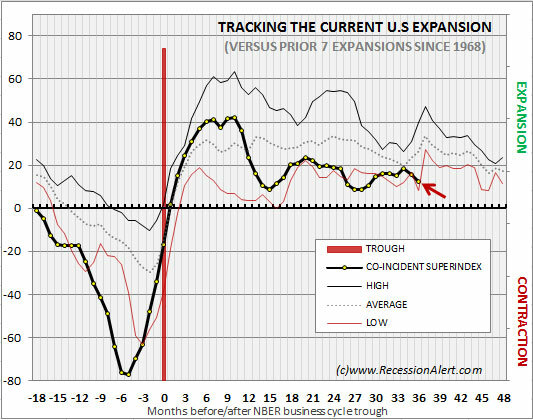 The track of the co-incident SuperIndex versus the last 7 business cycles aptly describes the tepid growth situation we find ourselves in – we are on the verge of printing a new historical low-watermark for growth after 36 months of expansion. Looking at the Leading SuperIndex, I think we are a bit worse off than last summer and the summer before that. We just put in a leading SuperIndex peak we identified to clients on 13 April (10 days after the SP-500 peak) that is lower than the prior two peaks. This slowdown, if not checked in time may well be the one that pushes us over the edge. 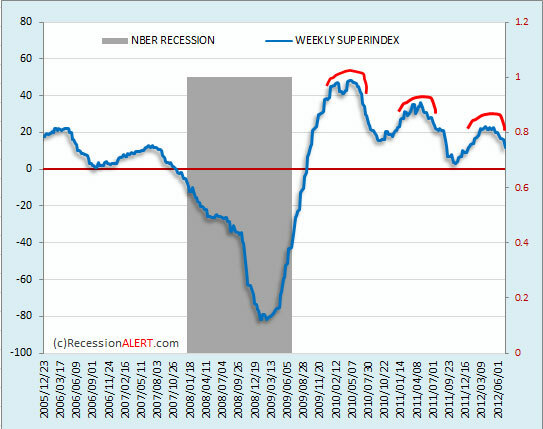 But that is still 2-3 months away using the SuperIndex recession-path projections in our regular weekly report. We also do not advocate single “all or nothing” reaction to recession signals. Because no system is perfect or likely to continue being perfect and nobody has yet managed to perfectly model an economy and its likely behaviour, we prefer a staged-action approach with our RFE to adjust to increasing market risk. Typically the longer leading models in the RFE will flag recession first and the co-incident and lagging ones last. As more and more models in the RFE flag recession we move more and more into cash (or hedge more and more). Hopefully by the time the last coincident model flags recession we are mostly in cash or fully hedged. None of the RFE models are flagging recession and with regards the 9 SuperIndex components, only the ECRI WLI, Philly Fed Survey and the ISM PMI are nearing recession territory. Of course a couple more weeks’ bad data and things could change quickly. If we look at the Philly Fed 50-state leading and co-incident indicators (which have a much shorter history than all the other models we use, hence we look at them separately) we are not in recession territory either. Not out the woods but not in the clutches of the fox either. You can track these together on nice monthly charts at the Federal Reserve Bank of St Louis which gives “some idea” about if we are in recession or not but is a bit difficult to determine how far from recession we are. The 2nd determination is a bit more important to the stock market operator or fund manager than the first. Now the problem with this model is that is has an average 1 months lag to NBER recession (some are leads but most are 2 months lags). The real-time data set has components that represent the prior month and we also have a publish lag to consider, hence the 2-months lags. But considering you get to know if we are in recession at worst two months into recession, it is a hell of a lot better than the average 8-12 months lag from the NBER committee. Unlike the SuperIndex and the other RFE models we deploy, the purpose of hauling out this model is not to warn you of recession but (1) confirmation of last-resort if you are in recession and also (2) give you an idea how far we are from possible recession. No model is infallible. Recession forecasting and dating is an art more than a science. We can try our best using the best models and adopt risk-adjusted stances to the market with our equity allocations. It is not impossible or unfeasible that what the permabears are saying come to light and we do indeed fall into recession sooner (or are already in one as many claim). But I think it unlikely according to the models and methods I prefer to use. Are there elevated risks? Certainly! Do these quant models exclude external risks, black-swans and shocks? Absolutely! I do not claim perfection in an imperfect world. In the end you have to make up your own mind- but at least this article gives you a balanced, opposing view to the tiresome popular perma-bear consensus so that you can make a balanced decision and not be blindsided by an unexpected or unconsidered result.